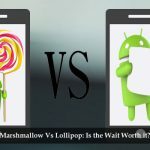 Marshmallow vs Lollipop Comparison: Which Version is Superior? There was a time when we used to look at the sky and detect the possibility of rain, snow or thunderstorm! Now the climate change is at the peak and sky isn’t an effective method of prediction. So, when you are going to some places — may be your workplace or some other trips — it’s important to know the weather in that particular place. It’s very useful in some other situations as well. For instance, if you can know that it won’t rain today, you can get your jacket off the bag. To do this, however, you can choose one of the best weather apps and widgets for your Android devices. Well, are you confused about finding the best weather apps out there? Here, in this article, we have created a list of top ten Android apps and widgets you can use for getting weather forecasts. That is, the next time you want to know the current weather in your workspace or home area, you can just pick the phone and look at the home screen. Shall we start with the list, then? 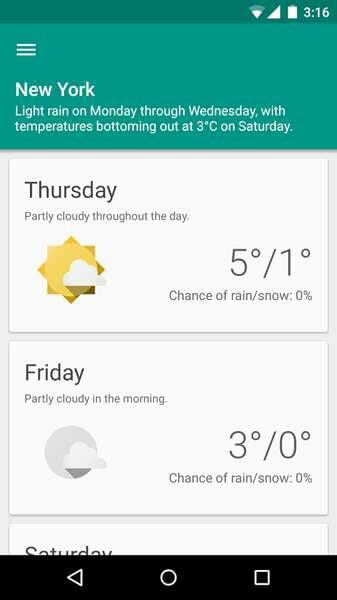 If you want the weather details to be presented in the simplest manner, using Material Design, you can make use of Simple Weather. 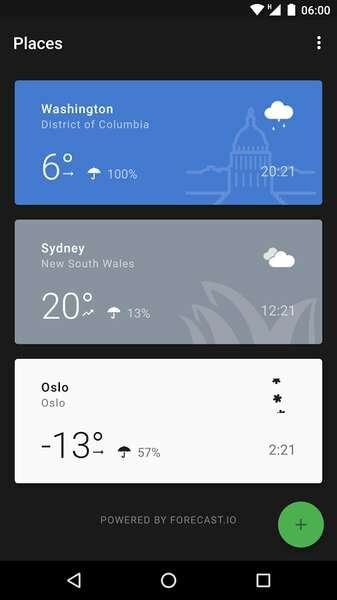 It is one of the best weather apps you can find for Android devices and all the details are given in an easily-understood manner. Different kinds of weather forecasts are available from Simple Weather. Firstly, there’s a type of forecast that gives an overview of current weather; then, there’s hourly weather forecast for planning your day; it also has weekly forecast, to help you take necessary actions. Talking about its UI, the Material Design is a perfect way for intuitive data presentation. You can move between days or hours to get precise details on weather. You can add as many cities as you want into the forecast list, set reminders to take actions based on weather and get weather-based maps too. Altogether, Simple Weather is the best for smart minds. That said, some of you may say that Simple Weather is offering less amount of data. 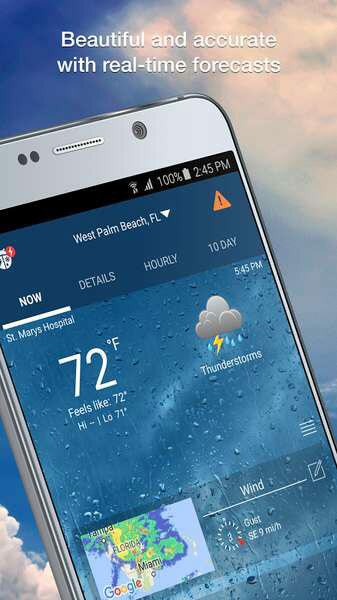 Yet another impressive weather app for Android, WeatherBug provides extra information on weather — instead of simply showing the location-based temperature. With weather forecasts available for more than 2.6 million locations worldwide, WeatherBug depends on the largest weather network to bring you the data. To get an idea, WeatherBug has more than 10000 weather stations, lightning detection network and live cameras for weather and traffic. WeatherBug is combined with an awesome User Interface, which gives importance to customizability and features. It needs to be noted that you can track the real-time weather information of the regions you want. Talking of forecasts, even 10-day forecasts are available from the WeatherBug network and NOAA. Other noticeable features of the app include enhance interactive map to show the weather data, lightning alerts to keep you safe, etc. It also has some utilitarian features. For instance, there are a few customizable widgets to be used, lifestyle forecasts to get details on the impact of weather on your day-to-day activities and the home reports based on current weather situations. For those who need an effective widget to show time and weather of the current location, here is Weather & Clock Widget. This completely free app brings a lot of Android widgets into your device and these widgets can be changed according to your need and taste. Talking of the widgets, they are just beautiful. Minimal and feature-rich widgets are available in the app and you can choose the best one depending on the taste. In the widgets, you can find information such as the current condition of weather, humidity, pressure, UV index, wind speed, wind direction, sunrise and sunset times etc. In short, in those beautiful widgets, you can find enough information about the current weather, along with meaningful forecasts. So, if you want to know the weather details without opening a dedicated app, Weather & Clock Widget is nice! Even while being an app, it allows you to show the weather of 10 cities at maximum, and we’ve seen the richness of data. AccuWeather has been here as a trusted choice as it comes to getting weather forecasts and realtime information for a particular region. So, AccuWeather by AccuWeather.com is a perfect weather app to find out the current condition of your city’s weather or so. You can count on this app if you want to ensure the authenticity of the data provided. 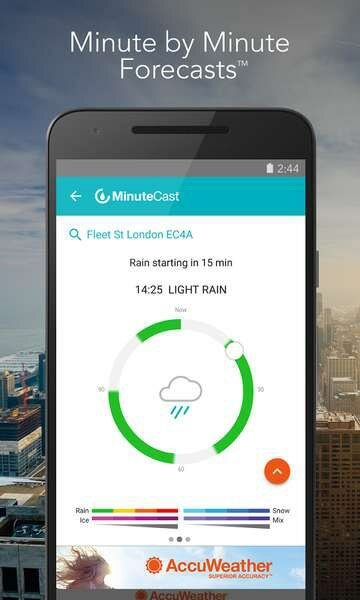 If we take the case of weather forecasts, hourly, daily and weekly forecasts are available from the application and its AccuWeather MinuteCast brings minute-by-minute weather forecast into your Android device. So, if it is going to be raining in the city in a few minutes, you can know that on time. You can get the same set of information for unlimited locations. That said, instant push notifications on weather are available only in the United States. Other features of AccuWeather do include the sunset times, status bar icon, weather news and videos etc. In short, AccuWeather is one of the best weather apps for accurate weather tracking and forecasts. All the features are professional in quality and it’s the best app for weather geeks. Weather Timeline is perhaps one of the most minimal weather apps you would find for Android device. If you like to have the important information at the first look itself, you can count on Weather Timeline. If for nothing, you should use the app for the elegance of design and data presentation. You may think that Weather Timeline is a revamped version of Google Weather, but you can’t be blamed. Weather details of different cities — which you have set beforehand — are available as Google Now cards, but with a cleaned background. For instance, there are signs for each kind of weather (clouds, raindrops and snow). In addition to these cards, you get different graphs that present information such as temperature and precipitation. Weather forecasts are presented in form of a timeline, which is quite appealing and easy to understand. Other noticeable features of Weather Timeline are its Android Wear support, Time Machine Forecasting, local weather alerts etc. If you need sufficient data presented in an innovative form, Weather Timeline is the most effective weather app you can get for Android. Even for the commonest user, the app would be useful. Yahoo Weather is often noted for the simplicity of User Interface and the effective manner of data organization. As you open the application, you can have the most important data on current weather condition; and you can go deep if you want. If you give importance to the visual impact of weather information and forecast, Yahoo Weather has lots of features for you. Suitable backgrounds will be chosen from Flickr and set by the app, according to the weather condition. Every day is going to be different from what you saw before. As we said, weather information is packed quite effectively. As we go to the forecasts section, different modes of forecasts are available and in the briefer glance itself, you get a clear idea about weather condition. Weather information is quite detailed and the time-period can be varied between 10 days and 24 hours. Additional options of Yahoo Weather include severe weather alerts, interactive maps that show temperature info, some cool home screen weather widgets, etc. As we said, if you wanted clean information in the cleanest form, you can go for Yahoo Weather! This is completely free to use and you won’t regret installing this app. We end this article of best weather apps and widgets with this app — Transparent Clock & Weather Widget, which is available for free of cost. So, once you have installed, you get a customizable set of clock and weather widgets for an android Smartphone or tablet PC. There are different widgets in different sizes — such as 2×1, 4×1, 4×2 and 5×2. According to the availability of space in your home screen, you can choose the most appropriate weather widget. However, the widgets show sufficient amount of information such as local time, automatically updated weather conditions, sunrise and sunset time, level of humidity etc. Other notable features of the widgets include the ultimate customization. In addition, 24-hour weather forecast and wind forecast are also available in the widgets, along with the detailed 7-day weather forecast. Considering all these, Transparent Clock & Weather Widget is the best Android weather widget app you can get. But, you should choose the best widget from the list. So, we have covered the seven best weather apps and widgets for Android Smartphone and other devices. In the list, most weather apps have integrated home screen widgets available, but still, you have the freedom to select apps to have dedicated widgets. In all the apps, however, basic features such as weather forecast and temperature have been ensured. So, you can pick the right one according to your requirement and the intended purpose. Gotta check some of these out! I really am sick of my boring base weather app the phone came with and was looking for a solid replacement so this post was perfect. Thanks again! I would really like to post a similar article regarding best weather apps and widgets for android devices but in my local city (Cape Town). Very informative. Thanks for the post really appreciated. Apart from these Google Weather is there with some advantage? Sorry, didn’t get you. Can you please elaborate? I use Weather & Clock Widget. The weather report often tell you the city weather but not exactly where you live. So it is basically just a forecast but not something accurate. There are many weather apps available in the market. Some only provide weather forecast and some provide forecasts with different features. 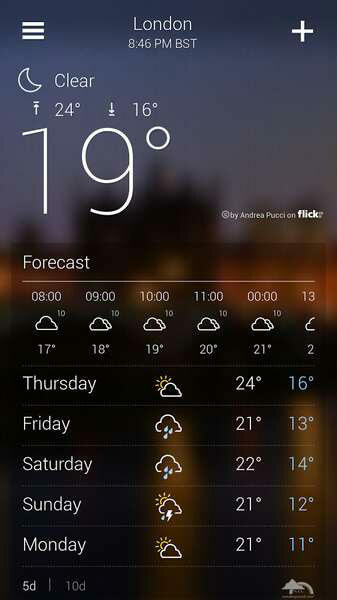 Weather Mate is also a great app for weather forecast. I was wondering why such a good app is not mentioned in the list. It is a free iPhone app with an animated radar/satellite map and a NWS radio to broadcast the weather forecast throughout the US. It also allows the users to customize the home screen themes and wallpapers. We have listed Android Wheather apps, your app supports iOS.